You know your brides and grooms are on Facebook. Some of them may even “like” your page, but you have to pay just to get them to see your posts. How on earth can you can you connect with couples without spending a bundle? The Facebook graph search is notoriously difficult to use. Have you ever tried searching for something on Facebook? Then you know exactly what I’m talking about. The brilliant Michael Morgenstern created the Search is Back! tool to solve that problem. It makes it easy to search for people, events, posts and photos from one easy menu. Even better — it’s free! This is undoubtedly a most awesome sneaky tool for booking more weddings. Let’s explore FIVE ways you can put it to work. 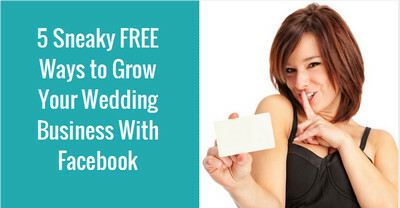 #1 – Find brides on Facebook. Use the “People” tab so you can find engaged females who meet specific criteria of the brides you want to book. Colorado and have an interest in weddings. This means you can use the “From” criteria to find brides-to-be who grew up in your area and have since moved away. That’s perfect if your ideal couples typically plan a destination wedding to your area because one or both of them used to live there. 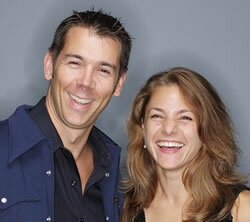 If your ideal couples are graduates of a college in your area, you can find them that way, too. 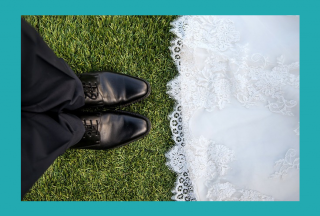 You might also do a search for the names of brides and grooms on the wedding show lead list so that you can determine which are the hottest leads before following up with them. #2 – Research couples before the meeting. Let’s say you’ve scheduled a meeting with a couple for next week. I highly recommend that you give the couple a “homework assignment” to do in preparation for your meeting. But you should also do some recon yourself. Use the Search is Back! Tool to search for the bride and groom by name. Friend them ahead of time (this will come in handy later) and study their profiles. What do they do for a living? What music, movies and hobbies do they enjoy? Where did they go to school? What can you learn from their photos? Use what you learn to stock your sales arsenal with examples and stories that are certain to connect with the couple. You’ll make getting the booking a slam dunk. 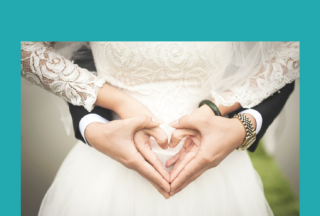 #3 – Find your local wedding influencers. Use the “Posts & Shares” tab to find Facebook posts about weddings in your area. 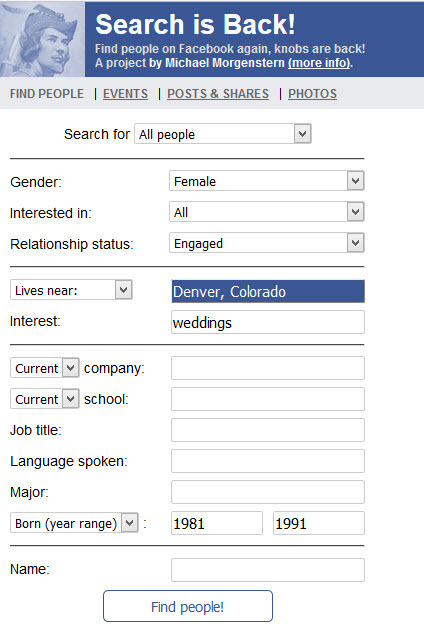 Just type in “Denver weddings” to get a list of recent posts, with those by your friends on top. You can search for posts made by your friends, friends of friends, or anyone who’s posted something containing those words. Use this particular strategy to find out who’s most active on social media in your wedding market Who’s talking about weddings in your neck of the woods? Friend and connect with these influencers in your wedding market. #4 – Keep tabs on the competition. You don’t need to be “friends” with your competition to keep an eye on what they’re doing on Facebook. Just search for their posts, photos and events. Wondering what other Chicago DJs are up to? Search for posts containing “Chicago DJ” and find out. #5 – Find photos of your weddings. For those wedding professionals who are not photographers, getting photos of your own weddings can be a huge challenge. Sure, the wedding photographer may mean to send you some photos from the wedding, but then she forgets and you’re left in the lurch. Now you can use the Search is Back! Tool to find them. 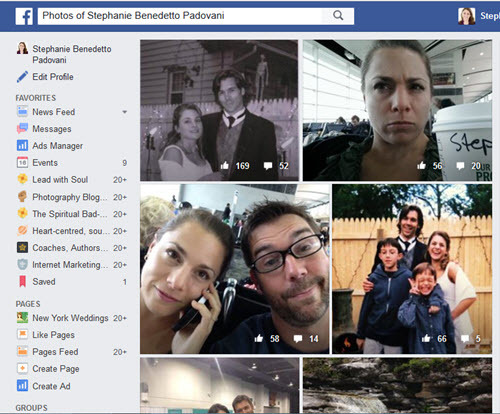 Just use the “Photos” tab to search for photos that your couple has been tagged in. Select “Add people to list” and enter the bride or groom’s Facebook profile url for instant access. Warning: get permission from the photographer before using these photos. Don’t Be a Creepy Stalker! Just because you CAN contact brides and grooms on Facebook, that doesn’t mean you SHOULD. Messaging and friending them when they’ve never heard of you is not only a little pushy, it’s kinda creepy. Before contacting the couple, consider how YOU would feel if someone who wanted to sell you something messaged you on Facebook. If you wouldn’t like it done to you, don’t do it to them. Save direct communications for individuals you actually know, and stick with stealth research for the rest. What do you think about this cool tool? How will you use it? Leave a comment below!